Nishant Batsha is a writer of fiction and histories. He is currently a writer in residence at the Prelinger Library. He is revising his first three novels. What began as a single novel that weaved together the global movement, tragedy, and resilience of two migrants as they made their way to California in the mid-1980s slowly turned into a trilogy of stories. He has completed drafts of these novels: Washed Ashore, All That Floats, and The Tideline. He holds a PhD in history from Columbia University, as well as a master's from the University of Oxford and an undergraduate degree from Columbia. His academic research focused on Indian indentured labor in Trinidad and Fiji. 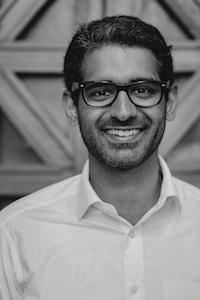 Nishant's writing has been supported by fellowships such as the Paul & Daisy Soros Fellowship for New Americans. He lives in the San Francisco Bay Area with his wife.